I arrived at Warsaw Chopin Airport about three hours before departure which was more than enough time since I already had my mobile boarding pass on my iphone. As I already have checked in the night before and didn't have any bags to check in, I went straight to the security check. After clearing security, I headed to the Fantazja Executive Lounge which is definitely one of the best lounges in Europe. Just before 5pm, boarding started at Gate 29. As the aircraft was in a remote area, there was no priority boarding. At least I was able to have a better shot of our plane. My seat, 5A was a window. Actually, all the seats on the plane were the same and they were actually very comfortable. 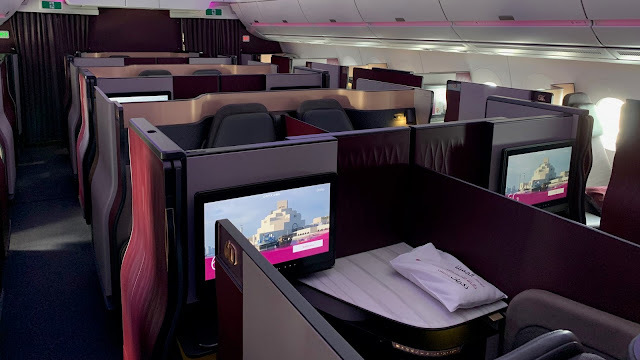 The business class cabin was from row 1-7, with a 2-2 configuration. On that flight, 20 of the 24 seats were taken. As for my drinks, I had a glass of apple juice. I thought the meal was very good specially the salmon. The crew, Anette and Emelina were very friendly and efficient and made sure that everything was okay with the food and asked regularly if we needed more coffee and tea. We landed at Copenhagen Airport around 18:30 giving me more than enough time for my connecting flight to Stockholm. To be honest, when I saw the aircraft, I thought that the seats would be very old and uncomfortable. But as soon as I was seated, I was surprised that the seats were actually very comfortable. The food was also a lot better than I expected for a short flight. Overall, I really enjoyed this flight from the service to the meal and would not hesitate taking this flight again. To the crew on this SAS flight, tack så mycket!